A native Calgarian, Dr. Liz’s academic career began with a Bachelor of Science degree from the University of Calgary. Combining her love of travel and her determination to be a veterinarian, Dr. Liz studied at the University of Veterinary Medicine, in Kosice, Slovakia. She graduated, with great distinction, in 2005 as a Doctor of Veterinary Medicine. After returning home to Calgary, Dr. Liz spent three years practicing at one of Calgary’s few cat-only clinics. Her desire to face new challenges, while continuing her love for feline medicine, has led Dr. Liz to take the helm of Wild Rose Cat Clinic. In December 2012 Dr. Liz succeeded in her pursuit of board certification in feline medicine. Click here to learn more about Dr. Liz and her certification in feline medicine. Clara is a 2018 graduate of University of Calgary, Faculty of Veterinary Medicine. Clara first joined Wild Rose Cat Clinic in 2015, as a part-time assistant during her veterinary studies. Before that, Clara attended the University of Alberta for her undergraduate degree. Clara is excited to share her love of cats and cat medicine with Dr. Liz and the rest of the team. Clara has two feisty kitty companions, Arya and Jaqen, who love nothing more than to play with sparkle fluffy toys! Janet came to Wild Rose Cat Clinic in 2005, from the Hamilton Ontario area. She had worked in Ontario for many years at The Cat Clinic, under Dr. Liz O'Brien. Although Janet does not have any medical training, she does have many years of customer service and office administration experience. Working with pets and their owners is one of her favorite areas! Janet is very proud to be the mother of two great sons, one living close by and one living in southern Ontario. She is happily "owned" by her cat Grace and her yellow lab Molly, who are both wonderful company. Animals never allow Janet to get bored, to say the least! Except for her cats, Janet, her sons, and the dog all enjoy being out in the fresh air and exercising. Kat is from Saint John, New Brunswick and moved to Calgary in Spring 2011. In 2005 she received her diploma in Administration/Veterinary Assisant and has been working in the veterinary industry ever since. Kat joined the Wild Rose Cat Clinic team in September 2011. When not working, Kat enjoys spending time with friends, reading, gaming and exploring her new city and surrouding area. In 2012, Kat was pleased to welcome a new man in her life - a rescue kitty named Thunder. More recently, Thunder gained a little sister in Storm. Since adoption, both have become well loved companions. Jennifer graduated from the Animal Heath Technology program at Lakeland College in 1998. She has worked in the Calgary area for the duration of her career. Jennifer previously worked with Dr. Ruelle and is very excited to be back to exclusive cat practice. Jennifer prides herself with her cat nursing care. She is always found talking and purring at her patients. She has a special interest in dentistry and client education. Jennifer and her daughter enjoy the city life. They love exploring the cities parks, geocaching, swimming, and hiking. 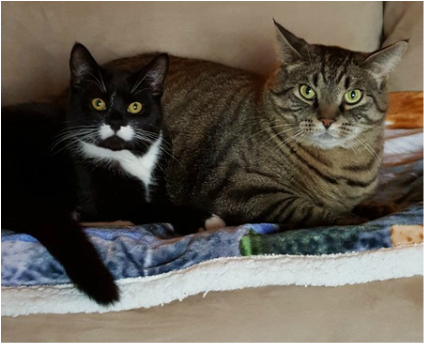 They love sharing their home with two adorable kitties, Miss Zucchini and Mr. Fredrick.